Simply one of the best and most respect authors of modern times. Be thankful he just can't stop writing. Since 1981, when Alasdair Gray's first novel (Lanark: A Life in Four Books) was published by Canongate, he has published more than twenty novels as well as numerous plays, poems and collections of short stories. 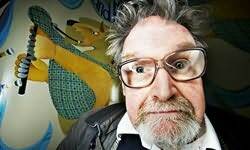 He is published and translated all over the world, but in his own words, '-Alasdair Gray is a fat, spectacled, balding, increasingly old Glaswegian pedestrian who (despite two recent years as Professor of Creative Writing as Glasgow University) has mainly lived by writing and designing books, most of them fiction.